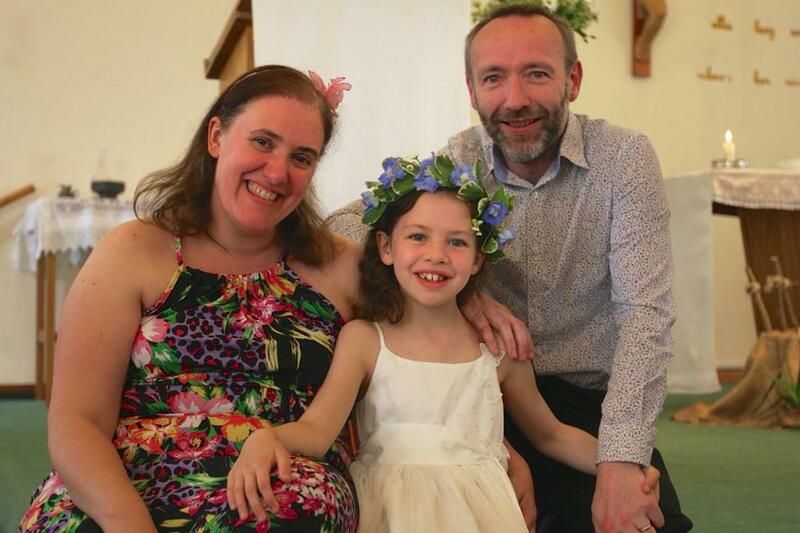 Sarah and David Beresford with their beautiful daughter Molly at her First Holy Communion. From April 2014 Sarah and David Beresford took over the Directorship of the Catholic Bible School. David and Sarah have been active in Christian Ministry with adults, young people, children, families, schools and parishes for over 25 years. They are experienced speakers, preachers, facilitators, retreat leaders, youth and children’s workers. David has a Masters in Biblical Studies from Heythropp College. Sarah is studying for a Masters Degree in Christian Ministry at the University of Chichester. Earliest records show that Nutbourne House and outbuildings were a farm and the chapel of the Nativity of Nutbourne was built in what was either a cow shed or one of the main barns. The farm house is a listed building and dates back to Georgian (1714-1830) although during the renovation programme part of the house was found to be much older and probably of Tudor origin (16th Century). A very exciting find was that a medieval map, a cross within a hundred yards of the present building showed that there was a church on the site several hundred years ago. The Parish of St Richard acquired Nutbourne House in the 1950’s, built the chapel (now the Headquarters building) and rented flats in the house to young couples whilst they were saving to buy their own house. Once the then Parish Priest, Fr Langton Fox, left, the house was left empty and eventually, after becoming run down and derelict, was boarded up and declared unfit for human habitation much to the relief of the animal kingdom. Joan and Michael Le Morvan had been searching for premises for a Bible School for some time, as the idea had been germinating from the summer of 1985. One day Joan was driving past Nutbourne House on the way to Mass and as she looked up she saw on the wall in large Roman letters, the words “Catholic Bible School”. She could hardly believe what she saw and the car did a few violent manoeuvres! Could Our Lord really intend that His Bible School should be housed in that terrible old run down and derelict building? Well, apparently He did. Just about everything that could be wrong existed in Nutbourne House and the task of refurbishing the property and making it habitable was daunting. With tremendous encouragement from our then Parish Priest, Canon Francis Collins, the property was bought from the Diocese by Michael and Joan in 1986. The Catholic Bible School was registered as a Charitable Trust – The Renata Trust (which means ‘reborn’ or ‘ new birth’). The Renata Charitable Trust was established in 1986 to sponsor the Catholic Bible School. This is an independent centre for adult religious education in the Catholic tradition. The Catholic Bible School does not receive any financial support from parish or diocese and is totally dependent on offerings. New Friends always welcome. Many international speakers are bringing their expertise to the school in a variety of modern up-to-date courses. The first courses started in January 1988 – Scripture Studies for Beginners – and the Bible School was formally opened by Bishop Cormac in May 1988. The programme now is very full with a comprehensive range of day courses. From 2002 to April 2014, the Catholic Bible School was under the Directorship of Geoff and Gina Poulter, who developed the ministry of the school and built up a strong group of supporters in the local area. David and Sarah, the current Directors are looking forward to working with you as they grow the ministry of the Catholic Bible School across England and Wales.